While often overlooked for time-tested touring routes in the south, Northern Ireland is also full of hidden treasures: quaint fishing villages, beautiful beaches and coastline, outdoor activities galore, and of course culture and history. This tour begins in Dublin and then heads north for several days before meandering south along the West Coast to Ennis, Killarney, and Cork and looping back through Birr to Dublin. Arrive Dublin Airport. Enjoy your private transfer to the Westbury Hotel for a two-night stay. Dublin is a prosperous and dynamic capital city, with a proud colourful past and a thriving present. Explore Trinity College and the Book of Kells, a beautiful manuscript created by monks ca. 800. Check out Dublin Writers Museum, Guinness Storehouse, trendy Grafton Street, and the youthful scene at Temple Bar. Dublin city never sleeps; in the evening, enjoy traditional live music in one of the many fine pubs. (We recommend O’Donohue’s!). Pick up your rental car in Dublin City this morning and enjoy the scenic countryside as you drive north to Co. Antrim. Overnight at the Bayview Hotel, which overlooks the Atlantic Ocean in the harbor village of Portballintrae. Your “to-do” list during your stay might include Giant’s Causeway, one of the great natural wonders of Europe; Old Bushmills Distillery (Irish whiskey); and the ruins of Dunluce Castle, perched 100 feet above the ocean on a pinnacle of basalt rock. Or visit Belfast and explore the history of the Titanic and the Irishmen who built it. Visit the beautiful Inishowen Peninsula and Malin Head, the northernmost headland of Ireland. Walk the glorious beach at Castlerock, or head to the Ulster American Folk Park, an open-air museum dedicated to the story of emigration from Ulster to America. Take a fascinating historical tour of the City Walls of Derry, the only completely walled city in Ireland. Westport is a popular holiday destination for families and boasts the kid-friendly Westport House, where a beautiful old estate shares double billing with a pirate adventure park. Visit Achill Islands, and be as active as you like – enjoy hiking, fishing, golfing, surfing, or horse-back riding, or just relax with a coffee or a pint and view the spectacular mountains, cliffs, and Blue Flag beaches. Follow in the footsteps of thousands of pilgrims and hike to the summit of Croagh Patrick, where St. Patrick reportedly banished the snakes from Ireland. 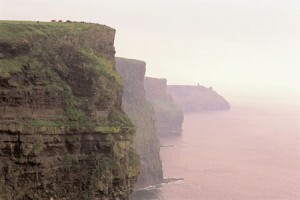 Visit Galway City and Cliffs of Moher en route to Co. Clare. Don’t miss the opportunity to walk on the Burren, with its lunar landscape, druidic altars, and exotic plant life. Explore Ailwee Caves & Birds of Prey Centre, home to birds from around the globe. Or visit Kylemore Abbey, and enjoy its pottery studio, tea room, romantic castle, and vast Victorian gardens. Time and weather permitting, you might also take a ferry to the Aran Islands, where Ireland’s native Gaelic is still spoken. Visit Kenmare, “little nest” in Irish, nestled between high mountains and the sea. From Kenmare, travel the winding route of the Ring of Kerry through the Iveragh Peninsula. Enjoy dramatic coastal panoramas, majestic mountains, ancient sites, and quaint towns along this popular route. Walk or take a horse-drawn carriage through the breathtaking Gap of Dunloe, found within the highest mountain range in Ireland. 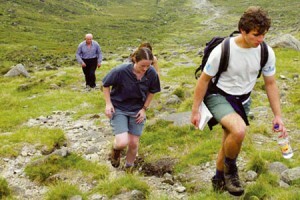 Visit Dingle Peninsula, once called “the most beautiful place on earth” by National Geographic. Take a scenic drive through west Cork on the way to Kinsale, where you will overnight at The Trident Hotel – there is no better location in Kinsale! Even the casual visitor to Kinsale will be captivated by its beautiful setting, with its long waterfront, narrow winding streets, colourful shops, galleries and cafes, and its pictureque, bustling harbour. Kinsale is known as the gourmet capital of Ireland and will capture your imagination! Visit the Cobh Heritage Centre, the port from which the Titanic set sail on her final voyage and where 6 million Irish left their shores between 1848 & 1850 in search of a better life. Visit Midleton Distillery or Cork City today before you head inland to Birr, County Offaly, for your final 2 nights at Kinnitty Castle. Set against a backdrop of the Slieve Bloom Mountains, Kinnitty Castle – a Gothic revival castle – sits center stage in an impressive 650 acres of rural parkland. Visit the Rock of Cashel, a spectacular group of medieval buildings set on an outcrop of limestone in the Golden Vale. Leap Castle, Ireland’s most haunted castle, kept watch for the lords of Ely O’Carroll and still stands fortress-like on its perch overlooking a vast stretch of the countryside. From here the O’Carrolls set out for vistory and defeat, here they brought their brides and captives; within the castle lurks Ireland’s most intriguing elemental presence – unique in that it reportedly give off a ghastly odor! This morning after a 90-minute drive to Dublin Airport, drop off your car and prepare for your journey home to the United State. We trust you will take with you many happy memories and we hope to see you again soon! 13-nights luxury hotel accommodation with private bathroom facilities. Private transfer from Dublin airport on day of arrival. 12-Days Hertz car rental, manual transmission, includes unlimited miles and CDW Insurance.